CAMP ZAMA, Japan (Oct. 11, 2018) -- Ninety-one students from across the Kanto Plain battled it out during the annual Brain Bowl academic competition Oct. 11 at Camp Zama's Community Club. 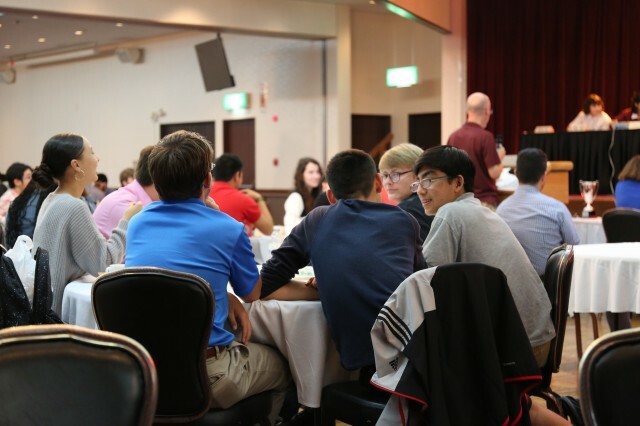 Zama American Middle-High School team coach Guy Snyder said the Brain Bowl gives students the opportunity to recognize their academic achievements and foster scholastic excellence in the Kanto Plain Association of Secondary Schools event. "The interaction between schools provides students with the opportunity to socialize with their counterparts from the various international schools in the Kanto Plains region of Japan," Snyder explained. His team brought an exposure to a more American way of life, while the international schools they competed against had a great mix of students from a variety of cultures, Snyder said. He said there were students from a dozen different countries competing in this year's bowl. "This helps to promote diversity and understanding of other cultures for our students," Snyder explained. The competition was fierce as the teams went head-to-head while sitting on stage in the main ballroom, surrounded by their peers and a panel of judges. The student who rang the buzzer quickest after the moderator asked the question got first chance to answer. Student were given a maximum of 15 seconds to answer mathematics questions, and 10 seconds on all other categories. The questions ranged from Japanese culture to current events, physics to the arts, and everything in between. One example: "Sixteen grams of a radioactive compound with a half-life of 25 days was left to decay in a laboratory. How long will it take for there to be only one gram of the compound remaining?" The answer? One hundred days. "I think it's really fun and tests your knowledge," said Zama American team captain Baylee Dorsey. "Even getting just one question correct can be rewarding." She said since this was her second year competing, she felt a bit more comfortable and knew what to expect. "What I learned from last year was to buzz in even if you just think you might know the answer," she said. One of her teammates, 9th-grader John Harrison, agreed, comparing the game to the popular television quiz show, "Jeopardy!" that he watches every chance he gets. Harrison said he also enjoyed the opportunity to interact with the students from the international schools, and the camaraderie of competing with his fellow students. "It's nice to ultimately grow as a team," he said. The Zama American team was rounded out by Lewis Walter, Milton Jones, John Harris, Logan McAbee, Kato Hayashi and Leah Sakamoto-Flack. The team finished in ninth place. Walter was named an Event All-Star, finishing individually in the top 10 students. Synder said the event offered the students the chance to work on problem solving, teamwork, the ability to express themselves and the ability to speak in front of a large group. Ultimately, "Students develop self-confidence and interpersonal skills that help prepare them for college," he said.